Over the past ten months, courts throughout the country have settled 320,513 cases of all types out of total 418,374 cases that they have accepted under jurisdiction, some 25,000 cases more than the same period last year. This was reported in a press conference held by the Supreme People’s Court on September 20 in Hanoi, reviewing the performance of tasks of the entire sector and introduction of the new attire of judges for the coming time. Addressing the conference, Chief of the Office of the Supreme People’s Court Pham Quoc Hung said the settlement of cases has seen many progresses and positive changes with most of corruption cases promptly brought to trial. The number of defendants in corruption cases given suspended sentences has also been reduced compared to 2015, Hung said. 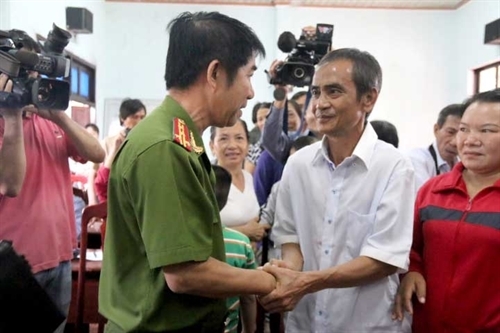 In addition, leaders of the Supreme People’s Court have also directed timely settlement of the remaining cases, including cases unjustly tried years ago that have recently been uncovered, such as Huynh Van Nen’s in Binh Thuan province and Tran Van Them’s in Bac Ninh province. Regarding major tasks in the coming time, Hung said the sector would continue stepping up the settlement of cases delayed due to fault of the court, increasing the quality of trial, ensuring court judgments be lawfully made to safeguard justice and human rights, and promptly paying compensations to unjustly convicted people. At the conference, court leaders also affirmed that they would ensure consistent application of law in trials through issuing adequate guiding texts, summing up trial practices for development of court precedents, and exchanging opinions and answering professional inquiries.